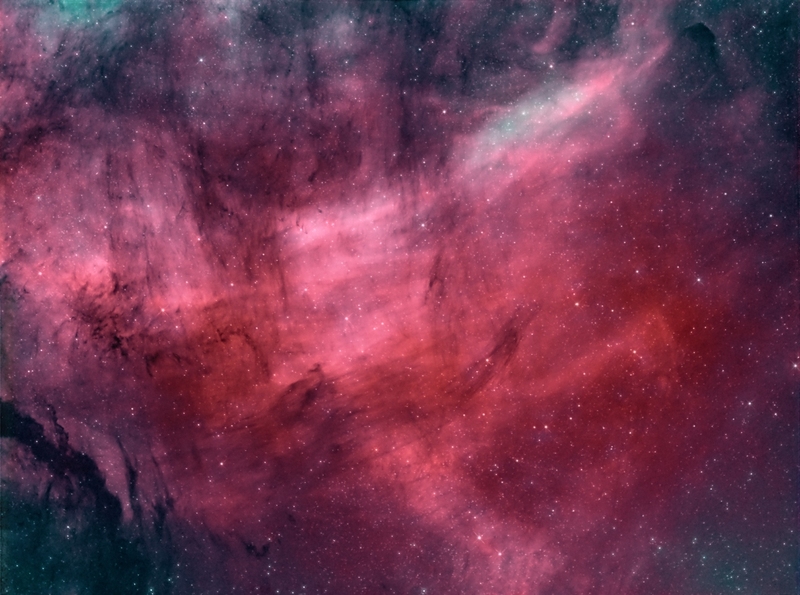 IC 5068 is a relatively faint emission nebula in Cygnus which is often overlooked because of its brighter and much more prominent neighbors, the North American and the Pelican Nebulae, which are located to the north (just outside of the frame) and belong to the same complex of emission nebulosity. IC 5068 is actually the designation for the central patch. The nebulae to the right and left of IC 5068 are LBN 329 and LBN 332 respectively, they are separated from IC 5068 by nearly vertical streaks of dark obscuring dust. This mixture is proposed by J-P Metsavainio and Richard Crisp. NGC 7000 - North American Nebula, IC 5067-70 - Pelican Nebula, refractor photograph. IC 5068 and Surrounding Nebulosity in Hα, which is part of this image. Notes: The individual exposure were taken in five different nights in the late summer of 2011, conditions varied a lot.